Super hit-maker Flo Rida has teamed up with R&B favorite Robin Thicke to bring us the addictive jam, “I Don’t Like It, I Love It”. We are totally loving this collaboration that makes us want to get up and do the Beto Shuffle (google it, it’s a thing). Give it a listen and we dare you not to dance along. 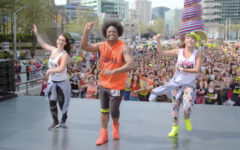 And check out the awesome choreography video below that you can try at your next Zumba® class.